The view of Old San Juan from the ramparts of San Cristobel Fort looking out over Calle de la Tanca which winds along the coast of the Atlantic Ocean, past homes painted jelly beans colors of purple, green and pink, their soft colors worn by the passing years, is picture perfect even on this day where the sky is gray and the clouds intermittently release sheets of rain. 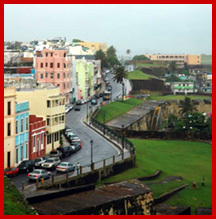 My 12 year old daughter Nia and I have made our way here from our hotel, the luxurious San Juan Marriott Resort & Stellaris Casino, located in the hip and lively Conduda section of the city, moving back into history towards the 27 acre fort, started in 1634 and finished in 1790 and a UNESCO World Heritage Site and a National Historic Site under the U.S. National Park Service. With its sheer 150 foot high walls, the fort is a massive stone structure designed to safeguard the island of Puerto Rico and the perfect place to begin my visit to Old San Juan, an enclave of colors, plazas, parks and streets lined with blue black bricks imported long ago from Spain. Though I'm not much on military history-and neither is Nia--and inwardly groaned when my friend Jody insisted that we stop here (I instead wanted to wander the winding streets of San Juan, admiring the Colonial style architecture which dates back, like the fort, to the 1600s, stopping in shops and trying the local delicacies while Nia wanted to do some serious shopping), I am almost immediately enthralled by the fort's interior including its creamy yellow and ochre walled courtyard and arched colonnades the leads to the rooms used by soldiers so long ago. Once lit by torches before electricity was installed in 1901, the narrow tunnels that crisscross the interior of the fort have niches where soldiers could hide or pack with gun powder so that the tunnels could be exploded behind retreating guards. In the prison-a gloomy spur off the main tunnel, a ship's captain whiled away his time spent here with hundreds of other captives, painted a picture of a sailing vessel. This, our guide tells us, is the largest fort built by the Spanish in the New World and where the first shots of the Spanish-American War. Nia likes the glass cases filled with mannequins wearing military uniforms from the different eras of those who have lived in this fort. So impressed is she by the end of the tour that she buys a charm in the shape of the fort to attach to her purse. Almost immediately upon leaving San Christobel, the sun begins to shine as we begin our walk to La Fonda El Jibarito, a local restaurant that specializes in the traditional foods of Puerto Rico. Unsure of what to order, I decide to try two dishes (for the cause), the mofongo con ajo mantequila (smashed plantains with garlic and butter) and pastilles masa relleno con cerdo-similar to a tamale except that instead of the meat filled dough being wrapped in cornhusks, banana leaves are used. Nia opts for the chicken tacos. We are both pleased with what we get and while eating, enjoy the lively atmosphere of the busy restaurant where so many people seem to know each other. Fortified, we are ready to begin exploring the stores, churches and historic buildings of Old San Juan. Besides the balconies with their flower boxes spilling with blossoms and the wonderfully colored facades, the doors of Old San Juan are so wonderful that they have inspired artists to make small replicas for display. These are available, along with other wonderful island artifacts such as santos (representations of Catholic saints) and papier-mâché carnival masks from Ponce that are said to chase away evil spirits, at Puerto Rican Arts & Crafts at 204 Calle Fortaleza Street, which is on the ground floor of a 200 year old Colonial building. After picking out our favorite door, we head to Casa Blanca, the White House and the oldest continuously occupied residence in the Western Hemisphere, built in 1521 and once occupied by Ponce de León's descendants for more than 250 years. In an interesting aside, Ponce founded the first settlement here in 1508 before he wandered on looking for the Fountain of Youth. The Spanish military took over Casa Blanca in 1779 and then the U.S. used it from 1898 to 1966. Now a National Historic Monument and home to a museum devoted to 16th, 17th and 18th century history, each room is decorated in a style associated with a period of the house's history. The street scenes are part of what makes Old San Juan so intriguing. On one corner, cement chairs and tables painted with chessboard designs are anchored to the sidewalk for those who want to sit down and play. There are parks and plazas everywhere, each with its own distinct theme. One favorite is Parque de las Palomas (Pigeon Park), located at the top of the city wall and overlooking both restored La Princesa Jail (now both a government office and an attractive art gallery) and views of the harbor, city and mountains. Another is the broad vast emerald expanse of land in front of El Moro, another stone fort overlooking the waters. Here, on Sunday afternoons, families take advantage of the coastal winds to keep colorful-and often homemade--kites afloat, filling the air with brightly pieces of paper. And though the day is almost done, there is still time for one more stop-at one of the many street stands selling paragua, shaved ice topped with a selection of flavors from mango to strawberry. It's a refreshing way to end the day. That evening back at our hotel, Nia and I sit on the balcony outside of our hotel room, listening to the background sounds of the waves hitting the shoreline and the tree frogs, so common here, making their rhythmic racket. The San Juan Marriott Resort & Stellaris Casino is perfect for children, the pool large and inviting with a great waterslide, the arcade room on the bottom floor an interesting diversion when swimming is done and the food options giving us a wide array of choices from grabbing a quick sandwich at the Coffee Merchant and Bake Shop in the lobby area to the Isla Grill and Beach Bar for lunch next to the pool to the formal, and oh so good, Ristorante Tuscany. It will be time to go home soon, but Nia makes me promise. We will come here again. MORE on Old San Juan at ToPuertoRico.com. 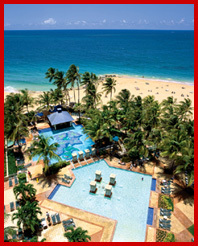 MORE on San Juan Marriott Resort & Stellaris Casino, call 800 464 5005. 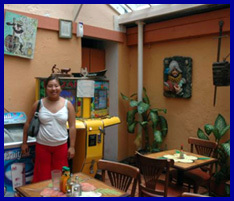 For tours of Old San Juan and other points of interest in Puerto Rico, Travel Services, Inc. 787 982-1200 or DestinationPuertoRico.com. ......Jane Ammeson writes about travel, food and personalities. Her work has appeared in Home & Away, Northwest Airlines World Traveler Magazine, the Chicago Tribune, the Grand Rapids Press, the Courier Journal, Zest and Chicago Life Magazine. She is also the author of four books including Madison, Indiana and Holiday World both published by Arcadia.